Indonesians voted in national and regional elections Wednesday with President Joko “Jokowi” Widodo widely expected to win a second term. However, late reports suggest his winning margin could be much smaller than anticipated. Security was tight but friendly around Tamon Suropati, a leafy park in the plush suburb of Menteng, home to former president Megawati Sukarnoputri, as voting began under clear blue skies. “Today, the election, I feel like Hari Raya, it means a big, big day for us,” said 69-year-old Enny, who voted alongside her twin sister for the incumbent, Widodo. For many it was a family day out. Adhi Rasjid, a 48-year-old mining executive, said voting was smooth despite concerns over “golput,” a term used to describe deliberately spoiled ballots and voters who abstain, particularly among millennials. “I think the turnout for the younger voters are increasing now, compared to say 10 years ago. I think the issues are more relevant. So I hope they take a bigger part in our democracy,” Rasjid said. There are 60 million voters younger than 30, and surveys have indicated that many could abstain and skew the final result. But retired three-star general Ian Santoso Perdanakusuma told VOA voting had gone well. Voting numbers peaked around 11 a.m. local time, and counting got underway at 1 p.m. after polling stations closed, with a clearer picture of the results expected to emerge later in the evening. Official results were not expected to be known for several weeks. Jokowi went into this poll as the clear favorite, carrying a 20 percentage point lead over his rival, Prabowo Subianto, following five years at the helm where he was praised for delivering on badly needed big ticket infrastructure projects and a national health scheme. The pair had squared off in five nationally televised debates with most political pundits judging the contest about even and analysts say Jokowi needs to win with a comfortable margin of 8-10% if he is to avoid protests and legal challenges by the opposition camp. 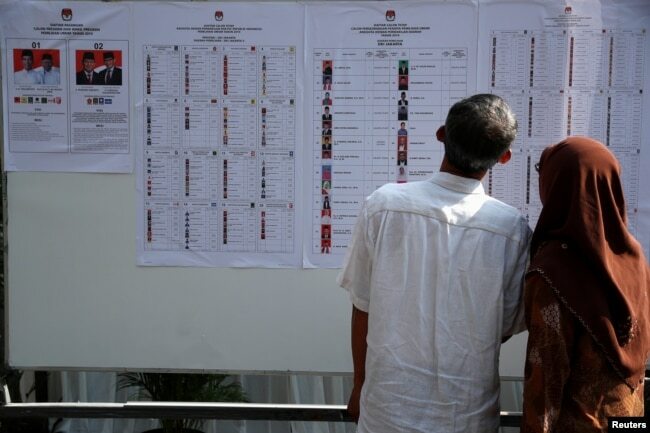 Prabowo has already raised the prospect of “ghost voters” and potential rigging in the fifth ballot to be held since the downfall of President Suharto in 1998 and the outbreak deadly protests across the archipelago of more than 18,000 islands. “Everybody who loses, pro-forma, takes their case to the constitutional court and then they accept the verdict afterwards. I see no reason to see anything different this time,” said Kevin Evans, director of the Australia-Indonesia Center. “People like to talk about Armageddon kind of outcomes here. They’ve been predicting violence at every election since I’ve been here and the only violence was during the pre-democratic period. In the democratic period, it hasn’t been the case,” he added. There were reports that voting was stopped in two districts in the troubled far eastern province of Papua, where residents were arguing with police and ballot papers unavailable. 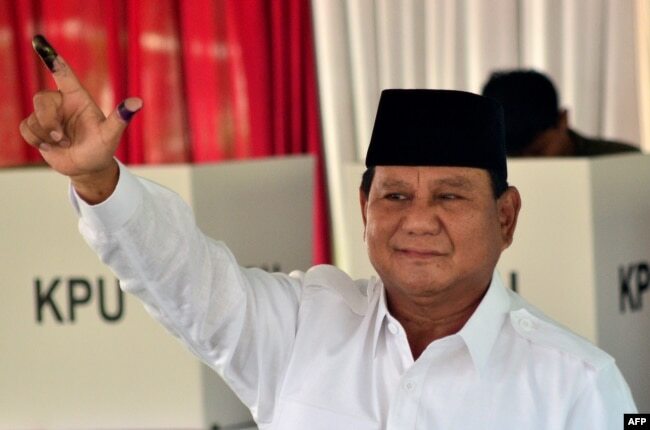 And as the polls closed and early counting began, online speculation was rampant that Prabowo had performed better than expected, with one tweet claiming he expects to win 63% of the popular vote. Another said the Jokowi camp expected to win by a margin of 2-3%. However, analysts cast doubts on those figures.